Not to rain on New York City’s parade, but the much ballyhooed nosedive in the city’s homicide rate is mainly the reflection of a national trend. Yes, it’s great that New York’s streets are safer, but all the nation’s urban streets are safer than they were around 1990—the height of the crack cocaine epidemic. Take a look at this list of the biggest 25 cities, ranked by homicide rate, and you’ll see that the relative standing of US metros has noticeably changed over the decade only for Dallas (which saw a bigger drop than NYC), Milwaukee and Columbus (which saw their ranking soar), and Los Angeles (which saw a 75% drop in homicide rate, almost identical to New York City’s 79% drop). On the chart, the numbers on the bottom show how a city ranks (smaller is worse,) and the heights shows you how close, say, Baltimore is to Dallas (not very) or Chicago is to Memphis (very). 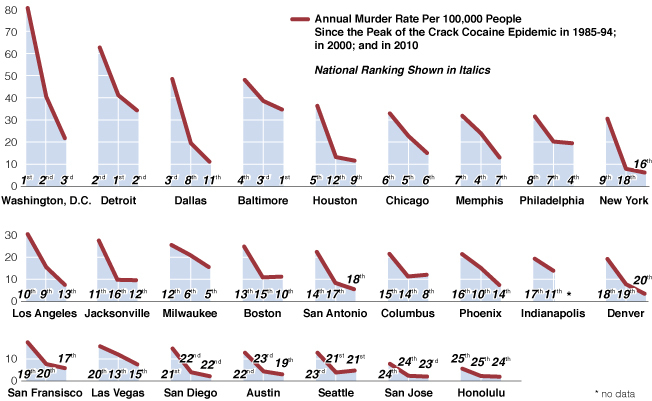 Thanks to Steve Levitt for the basic idea of comparing homicide declines in the top 25 cities. The other features are MetroTrends originals.